Traditional Polish custom of blessing food on Holy Saturday. 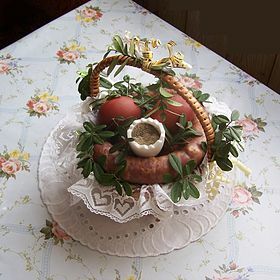 This Święconka basket contains: kiełbasa, boiled eggs, salt, pepper and bread. Decorated with bilberry leaves. Blessed food is eaten at Easter breakfast. Barszcz - Its strictly vegetarian version is the first course during the Christmas Eve feast, served with uszka (tiny ear-shaped dumplings) with mushroom filling (sauerkraut can be used as well, depending on the family tradition). Gulasz - stew of meat, noodles and vegetables (especially potato), seasoned with paprika and other spices. Pasztecik szczeciński - deep-fried yeast dough stuffed with meat or vegetarian filling, served in specialized bars as a fast food, different from Polish home-cuisine dishes, which also are called "pasztecik"
Sałatka warzywna (sałatka jarzynowa) - vegetable salad, a traditional Polish side dish with cooked and finely chopped root vegetables, potato, carrot, parsley root, celery root, combined with chopped pickled or dill cucumbers and hard-boiled eggs in mayonnaise and mustard sauce. Also made with carrots, red paprika, corn, red beans, peas, potatoes, pickled cucumbers, onion, eggs, sausages, mayonnaise, mustard, salt and pepper. Vodka (Polish: wódka) - since the 8th century. In the 11th century they were called gorzalka and originally used as medicines. The world's first written mention of the drink and the word "vodka" was in 1405 from Akta Grodzkie, the court documents from the Palatinate of Sandomierz in Poland. It is traditionally drunk with a 50- to 100-milliliter glass (shot glass). Popular brand names include Belvedere, Chopin, Sobieski, Luksusowa, Absolwent, Żubrówka, Wyborowa, Biała Dama, Polonaise, Żołądkowa Gorzka, Starka, Krupnik, Siwucha and Ultimat. Kisiel, a dessert served with bananas and grapes. When more water added, kisiel can be served as a hot beverage. Rollmops, carp, matjas and herring being very important in Wigilia Polish culture. 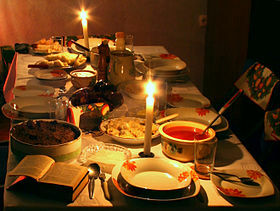 Christmas Eve table in Poland. ^ "Kluski śląskie (tzw. biołe kluski) - Ministerstwo Rolnictwa i Rozwoju Wsi". www.minrol.gov.pl (in Polish). Retrieved 26 August 2017. ^ "Śląskie niebo - Ministerstwo Rolnictwa i Rozwoju Wsi". www.minrol.gov.pl (in Polish). Retrieved 26 August 2017. ^ "Dzionie rakowskie - Ministerstwo Rolnictwa i Rozwoju Wsi". www.minrol.gov.pl (in Polish). Retrieved 27 August 2017. ^ "Fitka kazimierska - Ministerstwo Rolnictwa i Rozwoju Wsi". www.minrol.gov.pl (in Polish). Retrieved 27 August 2017. ^ "Krówka opatowska - Ministerstwo Rolnictwa i Rozwoju Wsi". www.minrol.gov.pl (in Polish). Retrieved 27 August 2017. ^ "Prazoki - Ministerstwo Rolnictwa i Rozwoju Wsi". www.minrol.gov.pl (in Polish). Retrieved 27 August 2017. ^ "Słupiański siekaniec dworski - Ministerstwo Rolnictwa i Rozwoju Wsi". www.minrol.gov.pl (in Polish). Retrieved 27 August 2017. 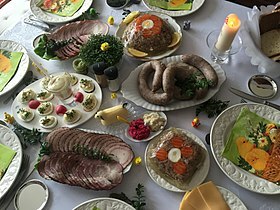 Wikimedia Commons has media related to Cuisine of Poland.